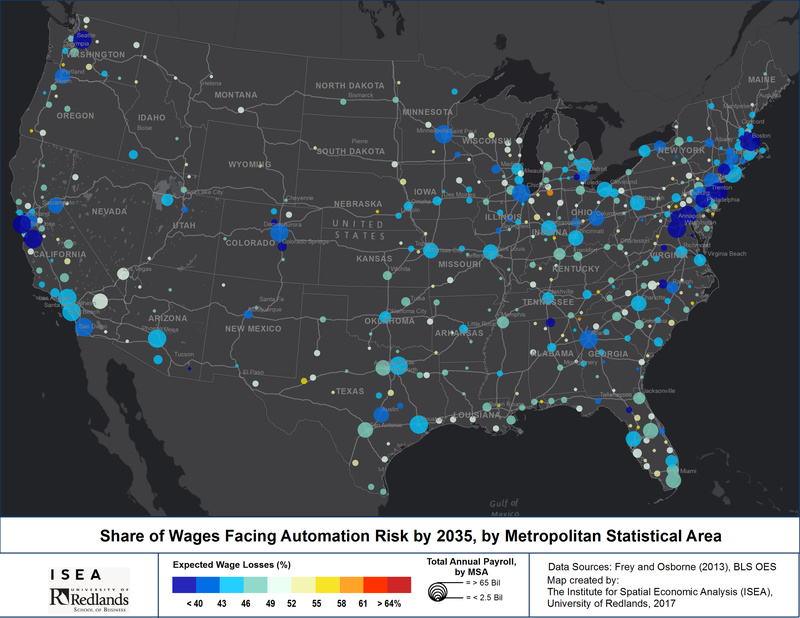 New research predicts that almost every major American metropolitan area will lose the majority of its jobs to automation in the next 20 years. In low-wage large metropolitan areas including Las Vegas, Nevada; El Paso, Texas; San Bernardino County, in Southern California; robots are poised to take more than 60% by 2035, according to analysis from the Institute for Spatial Economic Analysis. In cities with more jobs in the tech industry, such as Silicon Valley and Boston, fewer jobs are at risk -- but no area is expected to go unscathed. "The replacement of jobs by machines has been happening continuously since the Industrial Revolution, but it's expected to significantly accelerate in the coming 10 or 20 years," Professor Johannes Moenius, director of ISEA, said in a statement. "Pretty much everyone will be affected, but some metropolitan areas will see a lot more jobs vanish than others." The map below shows where the most "automatable" jobs are. The redder the dot, the more likely jobs are to replaced by robots. The bubble size represents how many people were employed in the area as of December 2016. 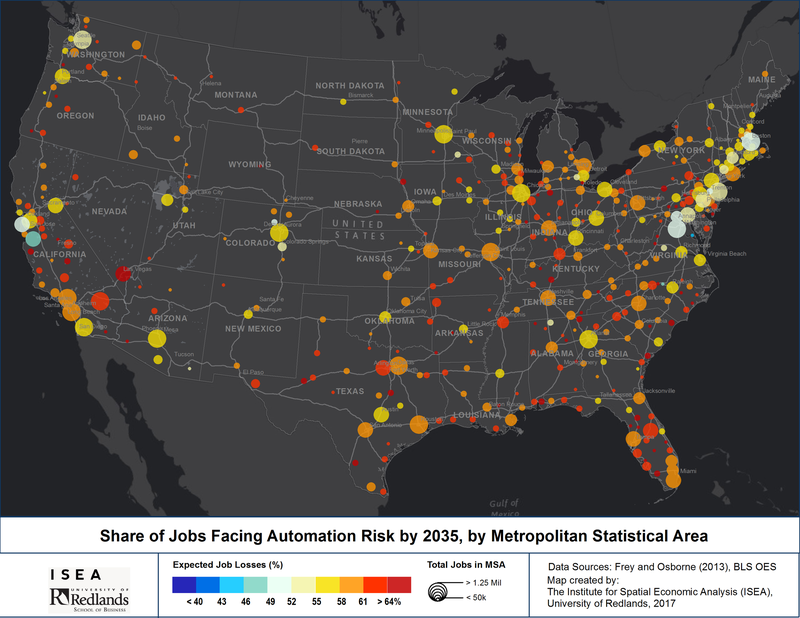 To figure out which cities would be most impacted, ISEA utilized employment data from the Bureau of Labor Statistics and research from Oxford on which jobs are most susceptible to automation. The largest chunk of the lost jobs are expected to be in food preparation and serving, office and administrative support, and sales. However, researchers expect even non-routine jobs like truck driving, healthcare, and education to be impacted, as technology continues to advance. The ISEA also analyzed the percentage of wages that will be lost as jobs are automated. This yielded less drastic results, as job loss is expected to hit lower-paying occupations that hardest. In other words, while many metropolitan cities will lose more than 60% of their jobs, people in higher-paying careers are less likely to be impacted. As jobs are increasingly filled by robots rather than people across a vast array of industries, experts are realizing the enormous impact that automation can have on people trying to earn a living. "I think that we are about to see a change in the economy on the order of the Industrial Revolution or the Agricultural Revolution, where you see a huge amount of human jobs change in a very short period of time," Sam Altman, president of startup accelerator Y Combinator, recently said. Jack Ma, the Chinese tech billionaire who is the chairman of the e-commerce giant Alibaba, was even blunter when speaking on the dangers of automation. "In the next 30 years, the world will see much more pain than happiness," the Chinese entrepreneur said at a conference in China, according to a report from Bloomberg.